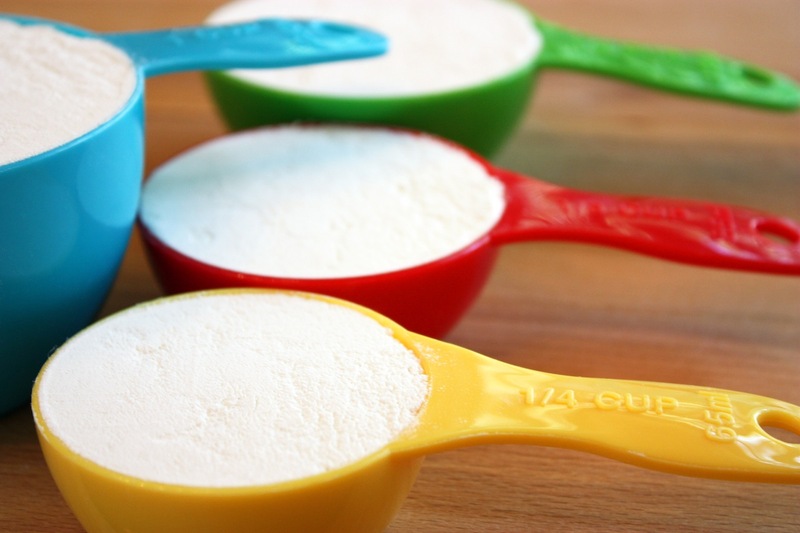 Flour must be aerated before measuring because it often settles in the bag or container making it heavy and compact, resulting in too much flour being measured. Aerating basically means fluffing it up and is not the same as sifting. Flour should not be sifted before measuring unless the recipe states to do so. Otherwise sifting will result in too little flour being measured. If you dip into flour without aerating, you will be getting too much flour and your dough will be too dry. To aerate flour you simply stir it around with a spoon before measuring. To measure, be sure to use a flat-topped dry measuring cup like in my photo. You can see how I aerate flour in my Quick and Easy Chocolate Cake video at the one minute mark: Click here to see it. After aerating, there are two ways to measure the flour: 1) Scoop & Level – Gently scoop the flour up with a spoon and sprinkle it into your measuring cup until it’s mounded above the rim. Do not tap the cup or the container of flour. Finally, level off the excess flour with the back of a knife. 2) Dip & Level – Gently dip your measuring cup into the flour until it’s mounded above the rim and level off the excess flour with the back of a knife. In my kitchen, a cup a flour weighs 4 1/2 ounces (130 grams). Whole wheat flour is not the same as whole wheat pastry flour and should not be substituted for whole wheat pastry flour. Whole wheat flour is milled from hard winter wheat and is best used only for yeast breads. A loaf made entirely with whole wheat flour will be a dense and somewhat heavy loaf. For a softer loaf, it is often combined with some all-purpose or bread flour. Whole wheat flour is not suitable for other baking like cookies and cakes. *Since it contains the germ of the wheat which contains oil, once opened, this flour should be kept refrigerated in a tightly sealed container. Also called whole grain pastry flour, this flour is good for most recipes that use all-purpose flour when you want to add fiber. Whole wheat pastry flour is milled from a soft summer wheat and is best for baking cookies, brownies, pancakes, waffles, quick breads, and some cakes. Results will not be as light and soft as using all-purpose flour but you can also mix part whole wheat pastry flour and part all-purpose flour for soft baked goods with added fiber. (I use this flour the most in cookies, brownies, even pancakes & waffles for extra fiber) This flour is not a good substitute for whole wheat flour and is not suitable for baking yeast breads. Don’t have whole wheat pastry flour? Regular whole wheat flour is not a good substitute – your baked goods will be dense and heavy. Look for whole wheat pastry flour at health food stores or you can order it online. Once opened, it should be kept refrigerated in a tightly-sealed container. This flour is designed for yeast baking. It helps create more gluten for a better rise in yeast doughs. Use it for yeast bread and pizza dough for a chewy texture and good structure. However, all-purpose flour works almost as well with yeast. From my experience, if you don’t have bread flour, all-purpose flour can be used as a substitute in yeast bread and pizza dough. The name says it all. Use it for cookies, cakes, quick breads, yeast breads, pies, pancakes, etc. This flour falls between all-purpose flour and cake flour and can be used in pastries, cookies and cakes. This flour is not suitable for baking yeast breads. This very fine grain flour is good in light and airy cakes like angel food cake. However, if a recipe does not call for cake flour and you decide to use it, you would use more (2 tablespoons more per each cup). Conversely, if a recipe calls for cake flour and you don’t have it, you can make your own: For one cup of cake flour, measure one cup of all-purpose flour, remove 2 tablespoons of flour and replace that with 2 tablespoons of cornstarch. I do not use cake flour – I don’t find it necessary. This flour is not suitable for baking yeast breads. This soft flour is similar to pastry flour but has salt and baking powder added. Many southern recipes call for this flour in biscuits and pancakes but if the recipe calls for all-purpose flour and you substitute self-rising flour, you will need to adjust any added salt and baking powder. (one cup of self-rising flour contains 1 ½ teaspoons of baking powder and ¼ to ½ teaspoon of salt) This flour is not suitable for yeast breads. 44 Comments on "Flour Basics"
Have you ever made your Faster No Knead Bread with gluten free flour (Bob’s 1 to 1 flour)? Just a thought, use a food scale to measure ingredients, I get more consistent results and can measure different ingredients In the same bowl. I’m a pretty decent cook but the only thing I could bake that people actually liked or asked for seconds was cheesecake. Notice I used the words, “could bake”. Thanks to Jenny I CAN bake bread now. You state that self rising flour is not suitable for yeast breads. My grandmother and I would have to take some issue with that. Her recipe for Irish Soda rolls calls for half self rising flour and half all purpose (or bread) flour and also uses yeast, so is certainly a yeast bread, though some of the leavening comes from the self rising flour too. The final consistency is somewhere between a biscuit and a fluffy roll made with only yeast, and is delicious. Thanks for sharing this – I learned something new. Sorry, that was not me. I like your recipes. Most of all I like your entusiasm when explaining the receipes. I hope that you still have the recipe for: Jagodzianki or Jagodniki. Sweet yeast dough with blueberries. Thanks a lot for explaining in such details, whatever you prepare. Thanks for the receipes. Hello! Thanks for all the info. I’m hooked on your No Knead bread – a couple times my bread has been a little more dense and a few have been more airy. Any tips on keeping my end result more consistent? Also, what is the difference between sifting and aerating? Whenever I wish my bread to be less dense I add gluten. It turned out perfect! Such an easy recipe! I have tried it twice and still mine do not rise. I don’t understand what could old be wrong. My is good and sits at room temp (I keep it in the Refrigerator. It does come to room temperature. I am using 50/50 flour. Mine never works. Please tell me which recipe and your exact ingredients and I will try to help. I want my recipes to work for everyone. Have you ever used unbleached all purpose flour? If so, are there any changes that have to be made? I just came across jennycancook.com this morning. Thank you for the simple, healthy, quick recipes and the details you provide about the ingredients and recipe instructions. And the videos are great. The tutorial on the various kinds of flour is most helpful. So many recipes I want to try. Have you or has anyone else experimented with King Arthur’s ‘White Whole Wheat Flour’ in any of your baked goods? I’m thinking I may try using it in No Knead Bread?? What do you think?? in all my baking where I would use whole wheat flour. It is whole wheat flour, but just lighter. Lighter, not white. I truly see no advantage to using it over whole wheat flour, and certainly not a substitute for white flour. Any chance you might experiment with gluten free recipes? We are wheat free and use almond flour or coconut flour for our baking. Thank you for such a wonderful website. It’s not only informative and aesthetically pleasing but it’s user friendly! Hi Jenny, a friend of mine gave me your recipe for no knead bread and now I am hooked!! Thank you! I was just wondering would spelt flour work for the no knead bread recipe as well? I’m not sure it has the right kind of gluten. You may need to research this. hi jenny,can your tortilla recipe be doubled? Yes, I have doubled my tortilla recipe. i have tried your crusty yeast rolls twice. The first time I thought my flour was old. I purchased new all purpose flour. Made the rolls according to the recipe, let it rise 3 hours (dough didn’t look like yours). Dough was more dense and looked heavy not light & sticky. Couldn’t make the lil draw string pouches, but did have 8 rolls. Let sit on counter 35 mins. Placed in 450* preheated oven for 25 mins they turned out hard & heavy. (1st time the inside wasn’t done, 2nd time the inside was more done, but outside uneatable) What went wrong? Please advise. it takes 20 mins for my oven to preheat to 450*, but I let the dough rest for 35 mins before putting into the oven. The yeast I just bought the day before. The flour was store brand and I did airate the flour. The water was hot, not boiling from my tap. It looks like you’re doing everything right so I’m not sure I can help you. You didn’t say the brand & type of yeast so please let me know. And do you have an oven thermometer to confirm your temperature? A dough that’s too heavy can only mean too much flour or not enough liquid – maybe you could adjust a little. The only thing left I can suggest is that the rolls need that first blast of a very hot oven and it’s possible your oven was not at 450 (my oven takes 30-35 minutes to reach 450) and I assume this is standard size oven with room for air to circulate. Other than that, I’m sorry these rolls have not worked for you. Hello I too have had the same experience and not going to try this recipe again and I found they tasted very salty.. In North Bay, Ontario, Canada I’d call them Hockey Pucks..LOL!! Thanks, anyway..
how long can i keep all purpose flour? does it expire? I never expected the thousands of daily visitors that come here and to my youtube channel and the number of questions is overwhelming. I do my best but sometimes it takes several days for me to catch up. I only share my recipes as a hobby so thanks for understanding. Jenny, love yr baking equipment, where did u buy alL those colourful spatula, cups, bowl etc n yr big wide blue working board for rolling your dough. Thank you for this information! I see what you mean by aerating now and I’m sure it will make all the difference in my tortillas. Can your bread recipe be doubled? Yes, it can be doubled as long as the Dutch oven is at least 6 quarts. Thank you Jenny. I love all your recippes and videos.